Fishing conditions in Northern Minnesota have definitely taken a turn for the better, in fact there might be more opportunities to get outside and catch a fish this week than there have been all winter up to this point. 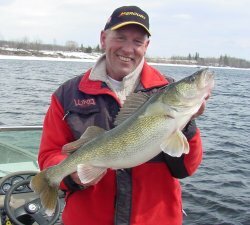 Thanks to the folks who opened up the ramp at Birchdale on Tuesday, we were able to get up to the Rainy River on Wednesday and get in on the first wave of Walleye fishing for this season. It's been a dozen years or more since I've been lucky enough to get in on the "early flight" and it was well worth the effort of getting up there. Lots of fish in the 14 to 17 inch range with the occasional larger one to keep it interesting. We did manage to get one about 8 pounds, but this was the exception. By the time you read this report, traffic on the river will have tripled and with Birchdale being the only large boat ramp that's open, you'll need to prepare for delays getting on and off the river. But it should be worth the trouble. Downstream, before you reach the Frontier Landing, the main channel was still ice covered, so anglers who can't make the trip for a couple of days will still have "new water" to fish. The later ice out means that the Little Fork and Big Fork Rivers probably won't break up until after the Walleye season ends. It looks like we could be set up for decent fishing all the through to the end on April 14th. Folks fishing on Winnibigosh are getting some of the better Perch action that they've had all winter. Fish are continuing to move toward shallower water and will ice thickness holding at around three feet, conditions couldn't be better for an extended spring ice trip. One of the better Lake Winnie reports came from an angler fishing in 23 feet of water about a mile off shore. This is typical for spring fishing as the Perch begin to migrate toward the shoreline. Anglers on Leech Lake report that both Perch and Crappie action has picked up and anglers are reporting some "decent" fishing. It's not going gangbusters, but they are catching enough fish to sort out a fair batch for the frying pan. Some of the shallower bays, weed edges and mid-depth holes are producing fish now. Tulibees are showing up in a areas where some of the Crappie and Perch anglers are fishing. Deeper water in the 20 to 30 foot range and suspended ten feet or more off the bottom. A medium size, flashy spoon with the hooks removed can be used to attract schools of Tulibee to your fishing hole. Small jigs like a 1/16 ounce Perch Eye or Swimmin' Jig tipped with a wax worm will catch them. My game plan is still to try and get on the ice for at least one Tulibee trip, but now with the river tugging at me, it's possible that I might miss my coach and turn back into a Walleye fisherman at midnight. No matter what, it's nice to have some new, good news about fishing after a long, windy winter. If you've been feeling a little cooped up, take advantage of this weekend because it looks like it could be about as good as it gets up here right now. I'm still doing my best to keep track of the legislation to reduce the Walleye bag limit and adopt statewide slot limits. To sum it up, the legislation is now out of the Environment and Natural Resource Committee has been referred to the Finance Committee use this link to read Article 3, Section 75 of Senate Bill (SF 3385). There is no companion bill in the House of Representatives and so according to conventional thinking, the bill should be dead for this session (as it should be), but the whole process has been so "SLIPPERY" that I suggest contacting your State Senator to discuss the regulation anyway. I'm adding a new page with some additional links and commentary about the regulation and I want your opinion so please click here for more about Walleye Regulations. I love getting the fishing season off to a good start! Even though we're still making ice fishing plans, a fat 28 incher gets me thinking about summer. 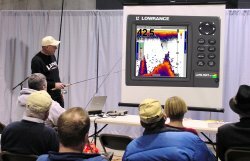 It's that time of year again, Boat Shows and special events are on the schedule, after a couple of seminars at the Grand Rapids Home and Sport Show March 28th. and 29th, I've got a few weeks before the next wave of events. Get the full rundown of appearances by clicking here. By the way, if you've been on the fence about "global warming", it might be time to look at some new statistics. Apparently, short term evidence shows that we're in another period of "global cooling" here's a link to some interesting data. Be sure to follow the links out from the article back to the original reports too. Winter conditions don't seem to be in any big rush to let us off the hook this year. We've had some stretches of fairly nice daytime temperatures (into the low 40 degree range), but it's been falling below freezing every night. So if you were looking for an extension of the ice fishing season, you're in luck. I ran into a friend who is a retired game warden this weekend at the Grand Rapids Sport Show after he'd been up on Winnibigosh. He said he found 38 inches of ice with almost no snow cover, driving conditions on the lake were excellent. Anglers on other Grand Rapids and Deer River area lakes are reporting ice conditions averaging around 32 inches with easy travel conditions except for some of the roads into the lakes, where mud is getting to be a problem. Both Perch and Crappie anglers are reporting some "decent" fishing. It's not going gangbusters, but they are catching enough fish to sort out a fair batch for the frying pan. Some of the shallower bays, weed edges and mid-depth holes are producing fish now. One good fishing report from Winnie came from an angler fishing in 23 feet of water about a mile off shore. This is typical for spring fishing as the Perch begin to migrate toward the shoreline. With a couple of weeks on break from the shows, I'm hoping for a trip or two into some good Tulibee water. This is generally a great time to catch a pail full for the smoker and I've been hearing of anglers catching some Tulibees as they fish for Crappies and/or Perch on some of the area lakes. Typically these fish are out in the 25 to 35 foot depth range this time of year and can be caught on small Perch Eye Jigs tipped with a wax worm. A flashy spoon with the hooks removed can be used to attract fish to the area you're fishing, once you see the suspended fish on your flasher, drop in the Perch Eye/Wax Worm combo and you'll be in business. 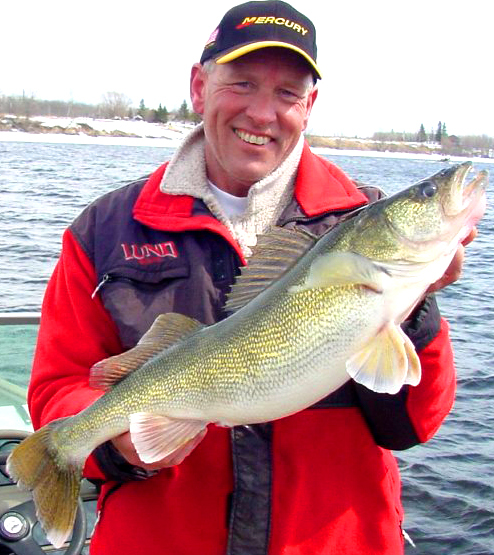 We've also got an eye open for an opportunity to fish the Rainy River. There are some folks fishing up there already, especially upstream from Pelland. But the fishing reports so far are ranging from poor to mediocre. Once the landing at Birchdale opens up, boat traffic will be pandemonium, but when we have such a short window of opportunity, we'll stake out whatever territory we can get. I'm doing my best to keep track of the legislation to reduce the Walleye bag limit and adopt statewide slot limits. To sum it up, the legislation is now out of the Environment and Natural Resource Committee has been referred to the Finance Committee use this link to read Article 3, Section 75 of Senate Bill (SF 3385). There is no companion bill in the House of Representatives and so according to conventional thinking, the bill should be dead for this session (as it should be), but the whole process has been so "SLIPPERY" that I suggest contacting your State Senator to discuss the regulation anyway. I'm adding a new page with some additional links and commentary about the regulation and I want your opinion so please click here for more about Walleye Regulations. Well folks, I just came home from a meeting of Walleye enthusiasts who were originally formed in 2005 as the "Walleye Advisory Council", now more casually referred to by the DNR as a "Walleye Workshop". Something about the term "advisory" must not sit well with the folks who organize these meetings, but that's a story we'll go into another time. Most of the agenda items are things you'd expect to hear about, Walleye stocking plans, fishing seasons, tourism, bag limits and lots of statistics and charts. But wait, hold on a minute...Bag Limits? Where's the chart? What happened to the statistics? Apparently the proposed statewide Walleye bag limit reduction from six Walleye to four is being brought about because it's "time for change". No charts, no statistics, just whistle three times as you roll through the train crossing and it's all over. No public hearing process, no public meetings. You see, none of the normal rules apply because this change is being introduced through the legislative process instead of "officially" through the DNR. Based on polling in a couple of popular metro area publications, anglers appear to support the legislation. The problem is that the polls are based on opinions of what I'm calling "elite anglers", the ones who devote enough time and resources to learn how to actually catch six Walleyes. Most folks who visit Minnesota don't fall into that category and for them, a reduction in the bag limit is a signal that somehow we think our fishery is in trouble. Why would anyone want to send that message when statistics show that our fishery is at least stable, if not improving? For the record, this was the only topic that was brought to an informal vote among the workshop members. There were nine members opposing the bag limit reduction and three in favor. The most passionate argument in favor of reducing the bag limit came from a man who is upset by what he believes is undue fishing pressure on his particular lake and wants the limits reduced to encourage folks to fish somewhere else. Why not just work toward improving the fishing on other lakes in his area so that folks will want to fish somewhere else? There's not enough space in this report to really go into all the details, but for those of us who depend on tourism, it's time to take a closer look. I'm asking the question; What's the big rush? If we need it, we need it, but lets have a look at some real statistics and make a real decision. I'm working on a more definitive article right now and I'll get a link to that as soon as it's finished. If you want to add your 2 cents worth click here to drop us a line. It's that time of year again, Boat Shows and special events are on the schedule, with an appearance at the Grand Rapids boat show beginning on March 14th. Get the full rundown of appearances by clicking here. Finally, the first sign of a meltdown. Only in the North Country, could temperatures of 30 degrees feel like a heat wave. After a long winter of sub zero temperatures, I felt like a squirrel coming out of my hole to soak up a few rays and let me say it is great. I spent the weekend working at an open house for Ray's Marine in Grand Rapids, so I didn't get to hit the lake until Monday. But the reports from the weekend were good on a couple of fronts. Perch fishing on Lake Winnie has been fairly steady this winter for folks who have had permanent houses. But now that some of the snow has compacted, slush is beginning to clear up. If you're careful, you'll be able to get onto to some seldom fished structure and take advantage of the winter's lighter than average fishing pressure. On the weekend, anglers fishing in the 25 to 30 foot depths had steady action, by Monday the clouds moved in and the wind picked up. Maybe it was the weather, or maybe we didn't find the hot bite, but our fishing was more sporadic. There were short spurts of action that lasted 15 minutes followed by periods of inactivity. We saw fish on the electronics steadily, but many were only lookers. Most of the fish we did catch had been eating insect larvae, so I started laying my rod down to avoid too much jigging. That helped for a while and I managed to pick up a dozen keepers by literally doing nothing. The Crappie anglers are still at it and they're finding above average schools of below average size fish. Most of the Crappies are still located out over deep water, but we'll be seeing some movement in the next couple of weeks. As the impulses of spring take over, fish will move back toward areas where they will feed and eventually spawn after ice-out. A good strategy will be to reverse the pattern that we follow in the fall. Follow the Crappies as they first move from mid lake holes toward deeper shoreline related holes. For example; an area of water 20 to 30 feet deep located within a couple hundred feet of the shoreline. Areas like this with access to shallower bays, weed beds and known spawning beds are a good bet. I have a good Lake Trout report coming from a fishing buddy and I'll try to update that as soon as he gets the pictures to me. in the meantime, if you want to add your 2 cents worth click here to drop us a line. Fishing Report! 2-11-08 Jeff Sundin The Last Blast? Dare I say it? Could this be one of the final dips into sub-zero temperatures. 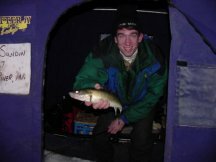 With only ninety days to go before the official 2008 Walleye Fishing Opener, I'm looking at the calendar with a little optimism these days. After we get through this arctic blast, I'm guessing that one or two more really cold spells and after that we'll be sliding into the final stretch. Last week we already had one of those nice pick-me-ups where the temps stretched into the upper 20 degree range and gave us a short, but welcome window of opportunity. Crappies, Walleye and Pike were most cooperative during the warm up and travel conditions on several of the smaller Itasca Area Lakes have improved. The lakes that had a lot of slush earlier, are actually some of the better ones to fish now because the slushy water finally "wicked" up into the snow and has re-frozen. Larger lakes like Big Winnie, aren't fairing quite as well because the winds have created some large drifts. If you can avoid the drifts, you can move around but be careful, a buddy of mine was stuck in Tamarack Bay for about 4 hours last week when his truck broke through the crusty surface snow and got hung up on the under carriage. If you want to fish out there, stick with the plowed roads and look for areas you can walk to from a good parking spot. Perch action on Winnie is good and there are a lot of fish biting, the problem is that you'll have to do a lot of sorting to get some better keepers. Like the 2007 season, when you find big schools of fish, they do bite aggressively. One trick for getting some of the larger fish is to get your bait away from the larger packs. If you fish higher (above) the bottom or move out horizontally away from the larger schools, you'll pick up a better percentage of the "phantoms". Fish in the 9 to 11 inch range are traveling in much smaller groups than the young 7 inchers. My ears perked up a little when I heard about some better than average Pike fishing out on the big lake as well. 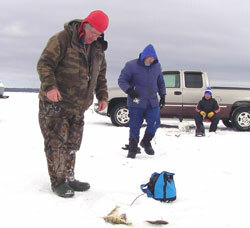 Tip Ups and frozen Smelt were the trick for one group of fishermen who worked the deeper structures last week. With only 13 days left, I'm going to try and hit the Pike when we get our next warm up. After that, I'm hoping for one of those late winter meltdowns to help us get around out the big lakes a little better again. If you want to add your 2 cents worth click here to drop us a line. It's that time of year again, Boat Shows and special events are on the schedule for me beginning on February 22nd, with an appearance at Ray's Sport & Marine's Open House in Grand Rapids. Get the full rundown of appearances by clicking here.